It sometimes feels as if David Lebovitz is an integral part of our kitchen curriculum. 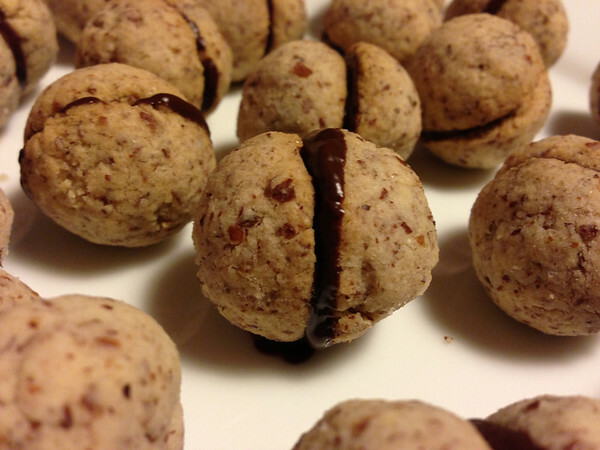 These Baci di Dama cookies are via him except we substituted almond flour for hazelnut flour. Whatever you do, don’t substitute the rice flour out. They imparted a nutty flavor that held up against the vast amounts of butter, chocolate and nuts in this cookie. I wish we still had the batch of hazelnuts a good friend got us from Oregon. But those hazelnuts had participated in making of homemade nutella based on yet another of David’s recipes. Instead of chocolate, we used the nutella as filling. Even without the filling, the cookies are amazing. With the filling, the cookies are superlative. If you are facing a weekend where your choice is between home improvement and making cookies, go for these please and I promise you that you will gain an year of life. Balancing hazelnut and chocolate can be tricky. My better half has been wanting to take a crack at making a chocolate hazelnut spread. He eventually will, but for now, after some suitable procrastination, he surprised me with mail order from Askinosie, a chocolatier we have grown fond of over weekly doses of Scream sorbet. 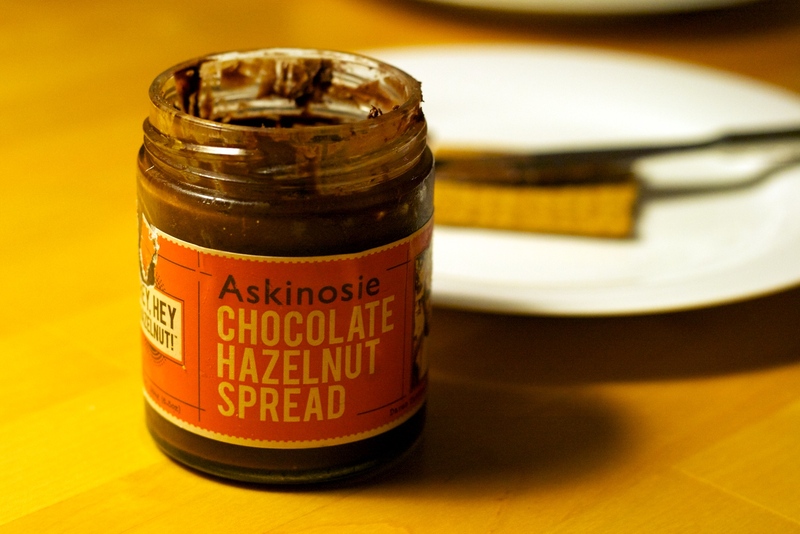 With chocolate as good as Askinosie, you don’t want the chocolate flavor overpowered, even with something as good as hazelnut. This spread is nearly perfect and since its arrival, has made its way on our home made biscotti, and crepes. 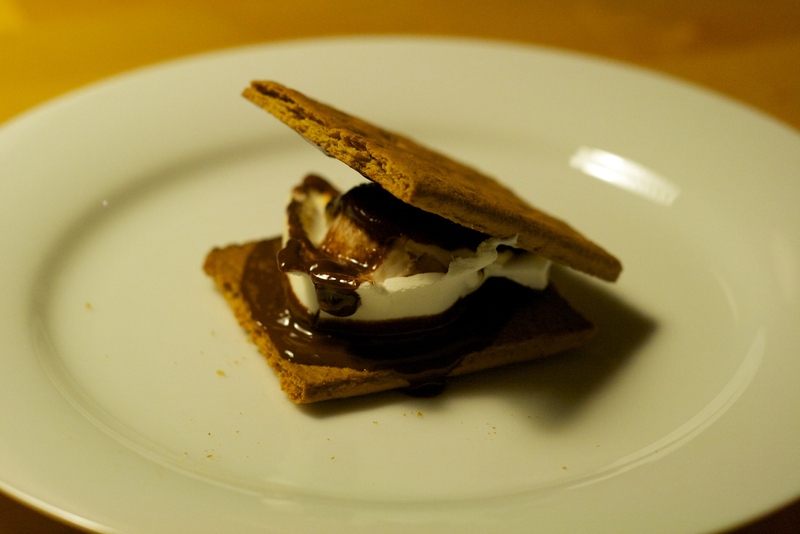 A more recent guilty pleasure is with s’mores (marshmallows and graham crackers). I am mulling over the thought of crepes, chocolate hazelnut spread and marshmallows a la Breizh.